"Anansi Goes Fishing" is a story from the national touring production "Act!vated Heroes ". (currently touring) This page is for teachers to use to extend the learning experience after your school assembly. Anansi, the beloved spider/man of many African trickster tales, has the tables turned on him by Mr. Turtle, who tricks Anansi into doing all the work for him, a la Tom Sawyer. While tricksters often use lies or deception, Mr. Turtle uses clever manipulation of language and logic to trick Anansi. The performance also includes mini-performances of "Anansi and the Moss Covered Rock" in which Anansi tricks several animals into walking over a slippery rock; and "Anansi and the Story Box" where our hero spins a web to retrieve stories from the Sky God Nyami. Sometimes he's a man. Sometimes he's a spider. Sometimes he's both. He's Anansi, the original "spiderman", and he's been entertaining and instructing West Africans and their descendants for at least 1000 years. He was originally regarded as the creator of the world, and an intermediary between humans and the sky god Nyame. He originated with the Ashanti tribe in what is now Ghana, but he has traveled to the Caribbean and even to the United States – where, according to one story, he arrived after stowing away in a medicine bag on a slave ship. And after he arrived in the New World, he became a source of comfort and inspiration and courage to the slaves who had been brought over from his homeland. The name Anansi, meaning spider, comes from Akan, a language spoken in Ghana. But Anansi is known by other names, including Kwaku Ananse, Bu Nansi, Nanzi, and (in the Southern U.S.) Aunt Nancy. (Sometimes "he" is a spiderwoman rather than a spiderman. Anansi is depicted in many different ways. Sometimes he looks like an ordinary spider, sometimes he is a spider wearing clothes or with a human face and sometimes he looks much more like a human with spider elements, such as eight legs. There are many stories about Anansi, all handed down by oral tradition. In many of them, he gets out of scrapes and gets the upper hand (or eight of them) by cunning and trickery – although once or twice (as in our story Anansi Goes Fishing) another animal gets the better of him. This penchant for defeating a seemingly superior adversary made him an excellent folk icon for slaves. He bears striking similarities to B'rer Rabbit, who originated with the Bantu people and also came to America via the slave trade. The story of The Tar Baby is common to both traditions. Justice and fairness require putting things in proper perspective. There are many stories about judges or dispensers of justice who issue rulings that defy logic. Most of them show how the law can be irrational or unfair. But in this story the main character behaves in a manner contrary to common sense, and the judge (an owl in our production, but a warthog in some versions) simply points out the fallacy in the reasoning. Listen to one of the audio stories listed below. Discuss the differences and similarities between the version you listened to and the one you saw on stage. How is listening to a story different from seeing one performed on stage? What do the actors do when they are playing several characters to distinguish them each other? If Anansi is a spider, why do you think he doesn't use his web to catch fish instead of weaving a net? How many ways does the Turtle trick Anansi? How does he lead Anansi to make the wrong conclusions? Should the judge have ruled in favor of Anansi or Mr. Turtle? For this game all you need is a ball of string and a story to share. Have your students sit in a circle on the floor. One of the students gives the beginning sentence of a familiar story. Then the student holds onto the end of a ball of string and rolls the ball to another student, who will give the next part of the story in sentence form. This is repeated until the story has been told. Soon you'll have a spider's web in your students' circle. Any story can be used for variation, or new stories can be created with each student adding a new idea! 398.2 and j398.2 in a local library is where you will find more folktales from around the world. The Anansi stories originated with the Ashanti tribe, which is based in Ghana, a country in western Africa. Ghana has an area of about 92,000 square miles (slightly larger than the state of Minnesota). Although 9 major languages are spoken there, along with dozens of others, the official language is English. Until establishing its independence from the United Kingdom in 1957, Ghana was known as Gold Coast. Map Skills: Present a world map and have the students locate Ghana. Preparation: Cut egg carton cups apart. Poke 8 holes in each cup for the legs, leaving room for the face on one side. Put your spider's legs by poking them through the holes. Glue eyes and mouth on. 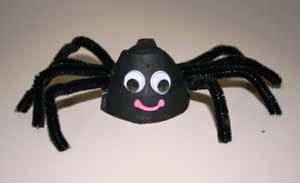 Optional: tie a piece of elastic or rubber band to the top so your spider can dangle from a web. In the beginning of the story we are introduced to Nyami, the sky god. Research masks made by the Ashanti people. Try making your own masks based on your research. Try making the flag of the Ashanti people. The symbol in the center is the Golden Stool, which represents the power and authority of the tribal ruler. According to legend, the Golden Stool descended from heaven for the first Ashanti king.